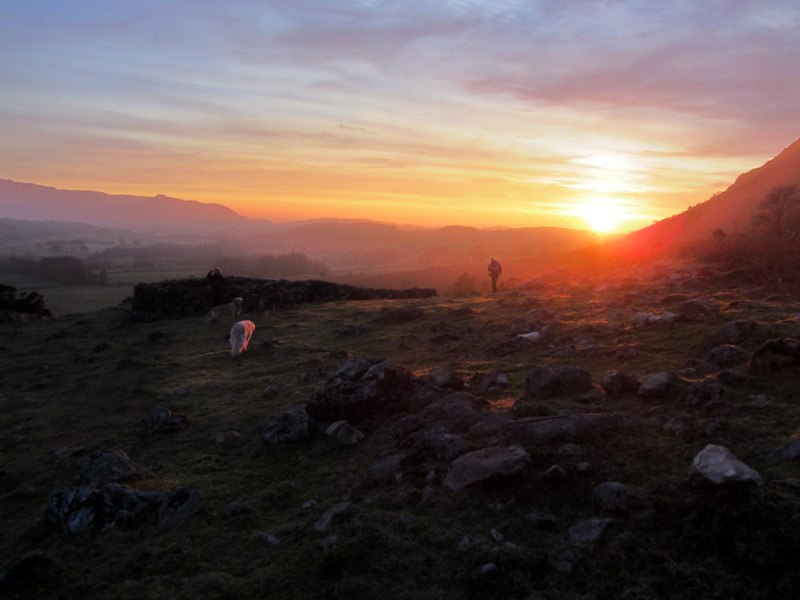 " Middle Fell and that Sunset "
Date & start time: Saturday 7th February 2015, 12.30 pm start. 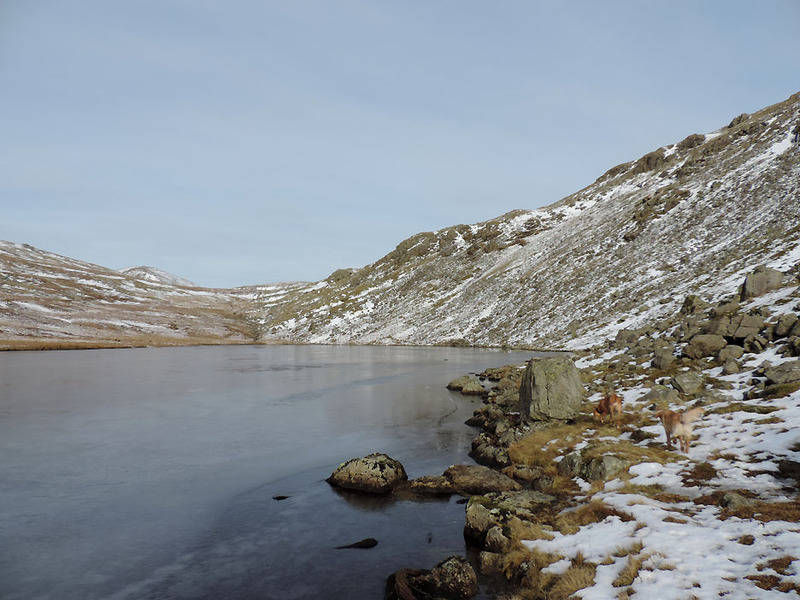 Places visited : Greendale Tarn, Middle Fell, Buckbarrow Moss, down via Tongue Gills. Walk details : 4.8 mls, 1750 feet of ascent, 4 hour 40 mins. 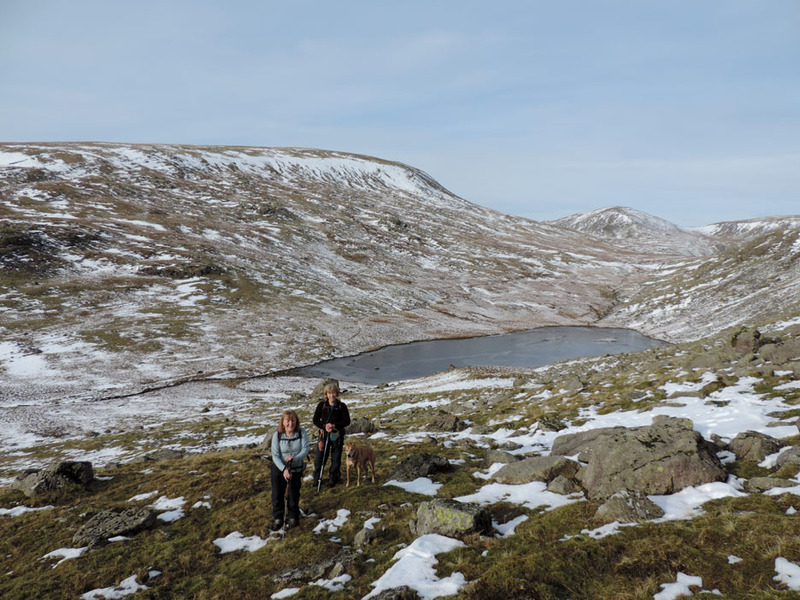 Highest point : Middle Fell, 1890 ft - 582 m.
Weather : Sunshine all the way but with a cool breeze at times. 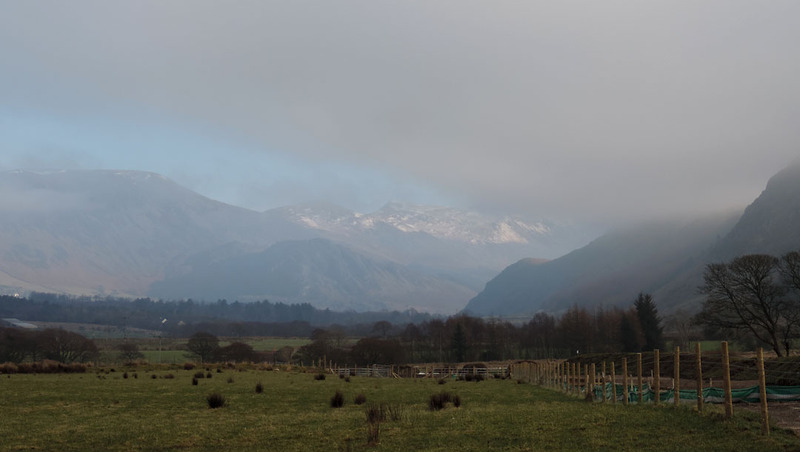 We started the day with reasonable sunshine but then the cloud rolled in and it turned cold and murky. 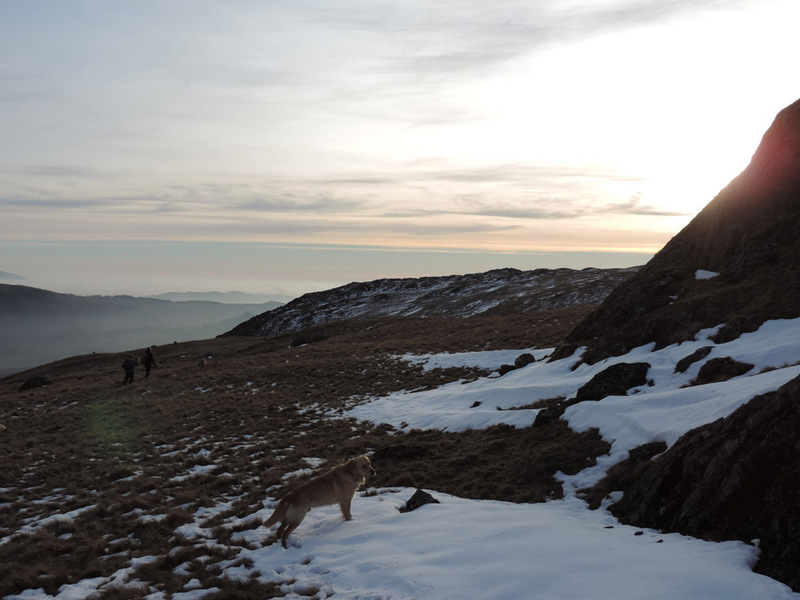 hopefully for a good walk up Middle Fell, weather permitting. 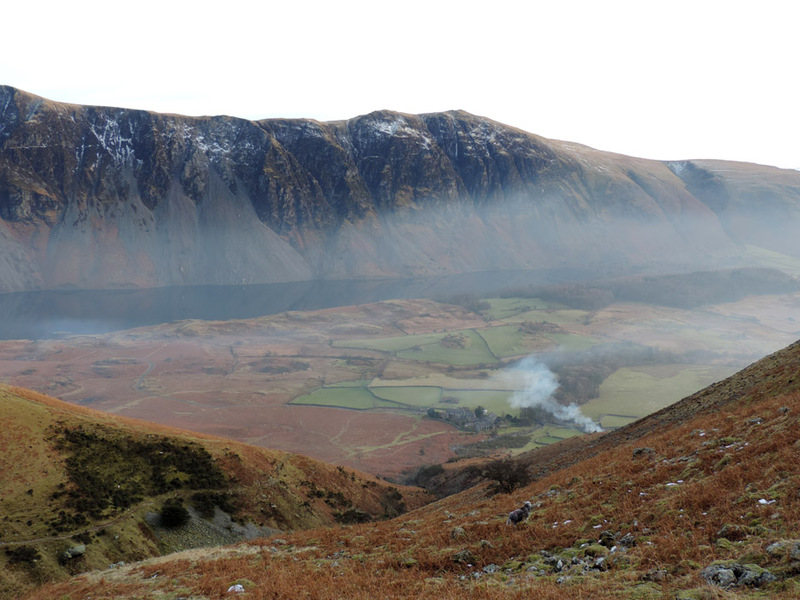 A gap in the clouds as we cross Ennerdale Valley on the Cold Fell road. 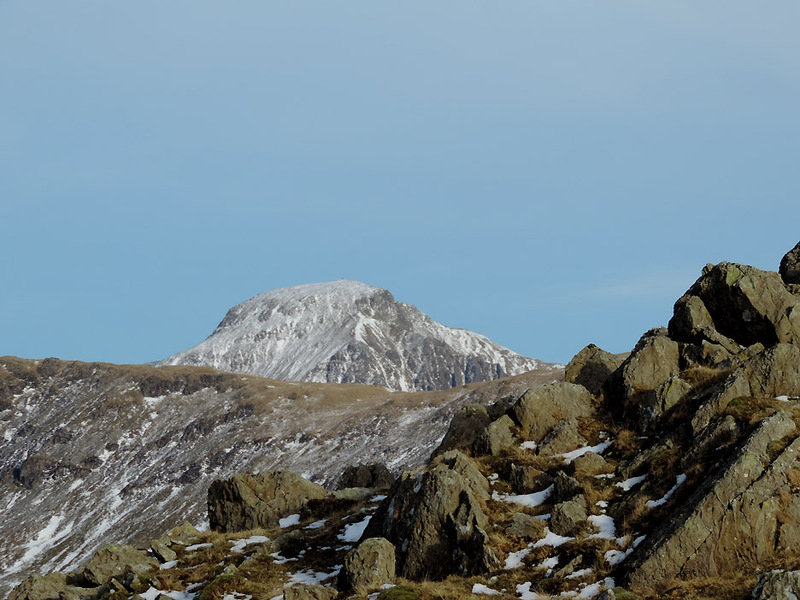 That looks like Red Pike on the western end of the High Stile Ridge. 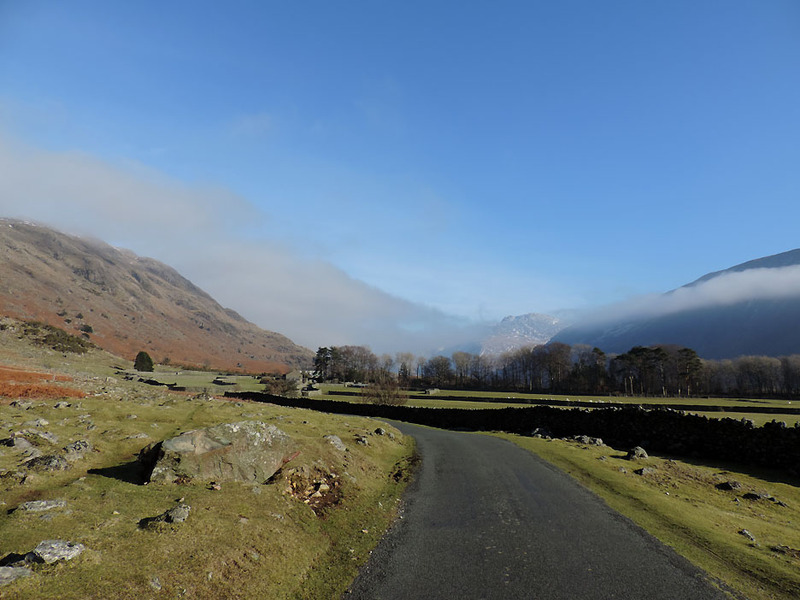 but there was cloud in Upper Wasdale and we could only just make out the Scafells as we passed Harrow Head Farm. From a little further on the head of the valley certainly wasn't clear . 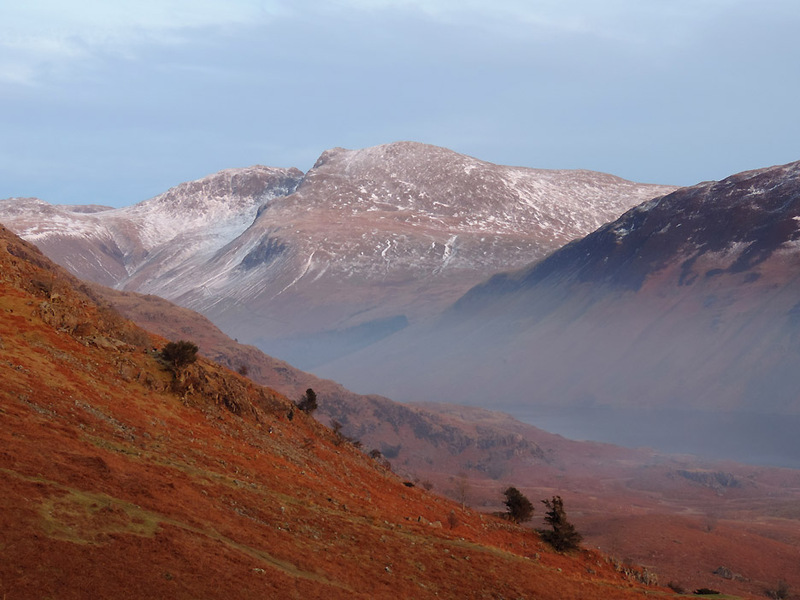 . .
the cloud had rolled away and we could see Scafell, Scafell Pike and Lingmell. 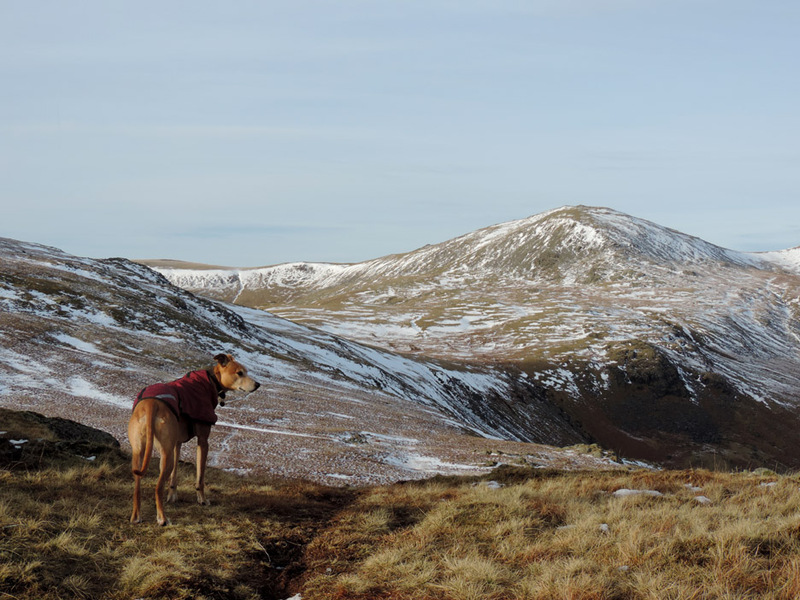 The three of us would be heading up Middle Fell . . . here Ann and Jo pause with Amber for an initial photo. and fenced it off from the sheep, but not a problem as the footpath stays well clear. Looking back . 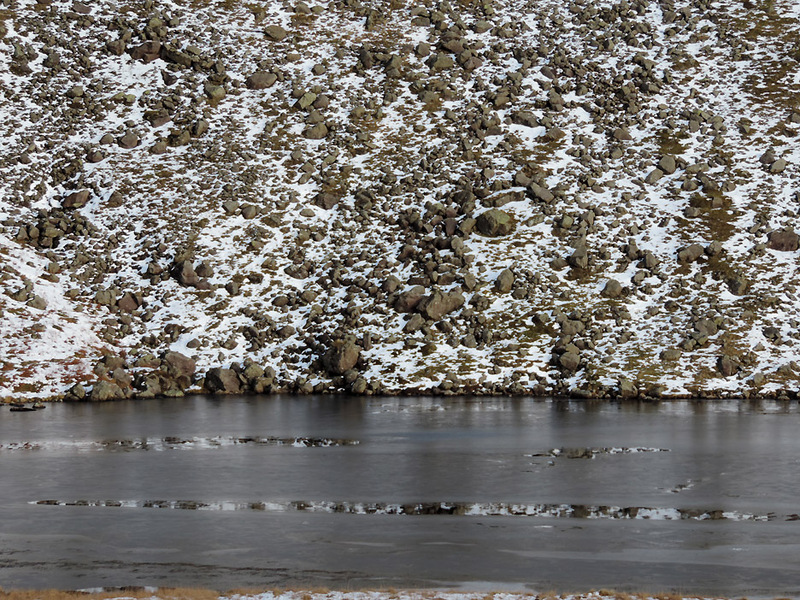 . . at the Wasdale Screes. but with the sun behind them the shadows hide all the classic rock features. 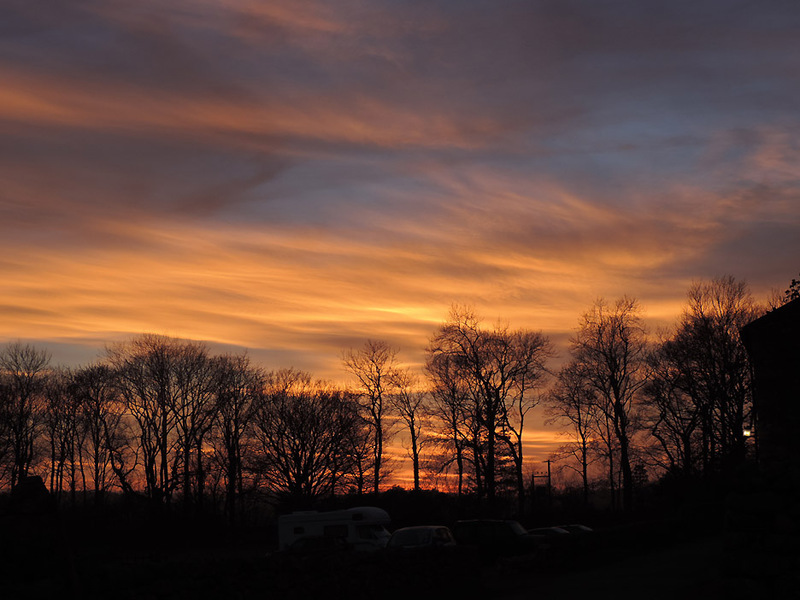 Perhaps with the sun further west later the view might improve. 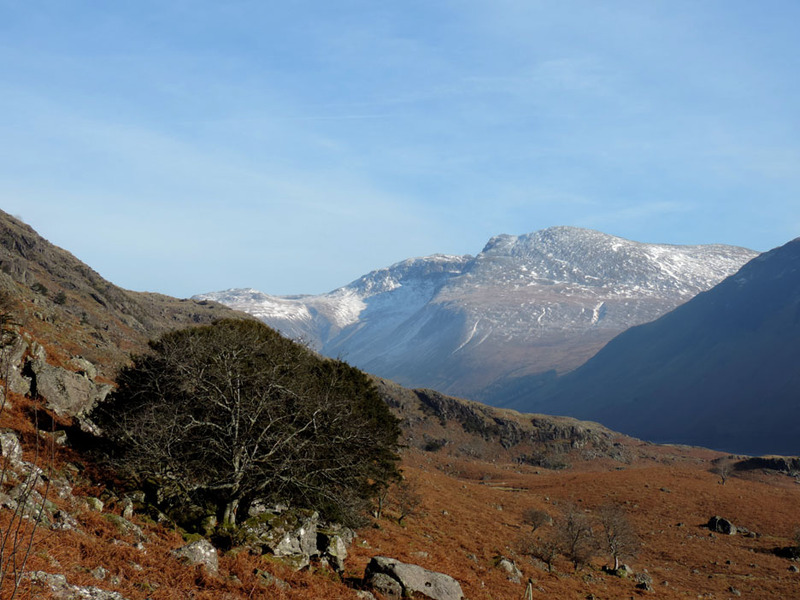 A picture of the Scafells with the optical illusion making Scafell higher than its more distant neighbour. 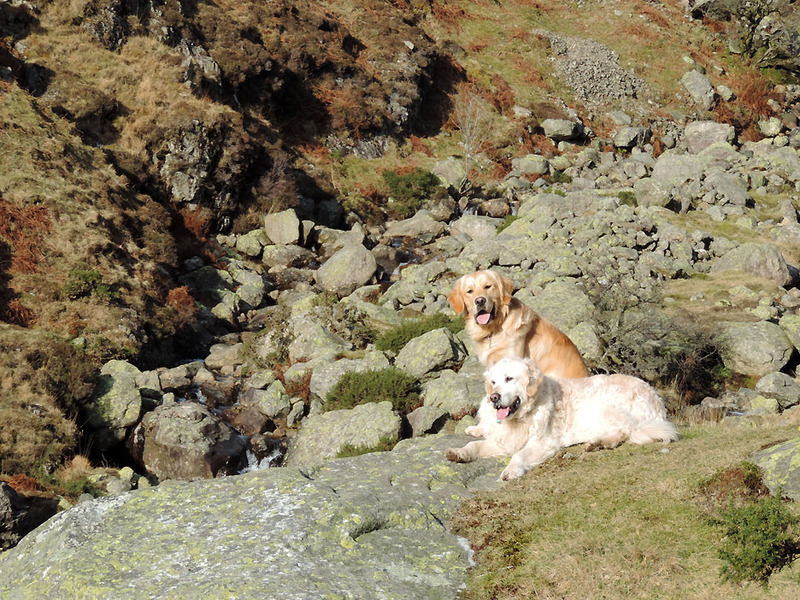 On the bend in Greendale Gill, the first part of the climb is completed so Harry and Dylan rest on the rock overlooking the river. 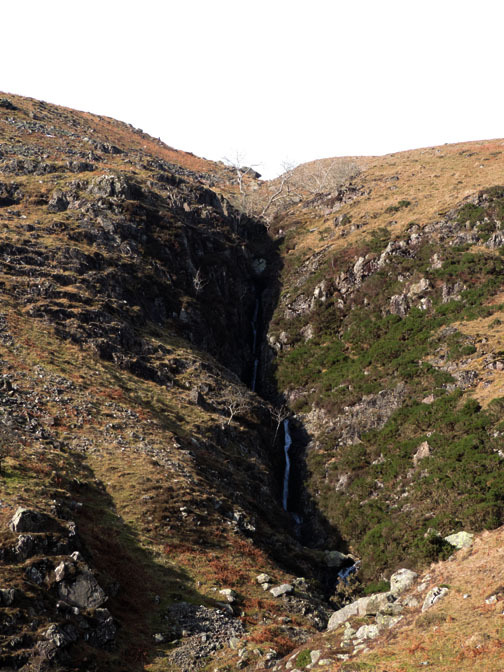 This is half the height but only a third of the distance to the tarn, still some thirty or forty minutes away. Still what's the rush . 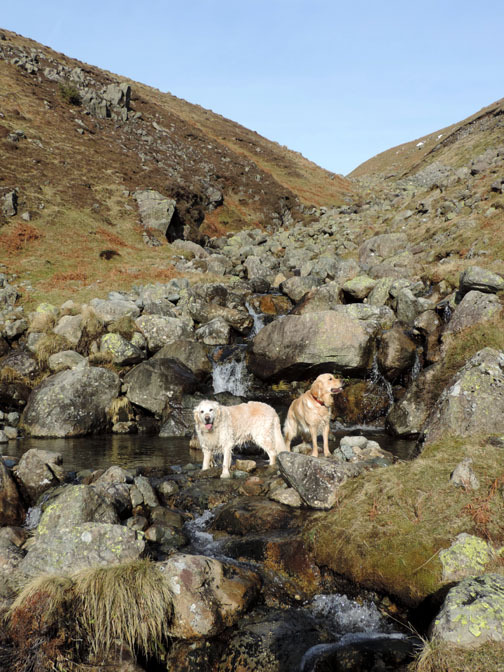 . . time to enjoy the water falls . . .
. . . and to dabble feet in the icy cold water ! The path continues, following the stream ever upward. 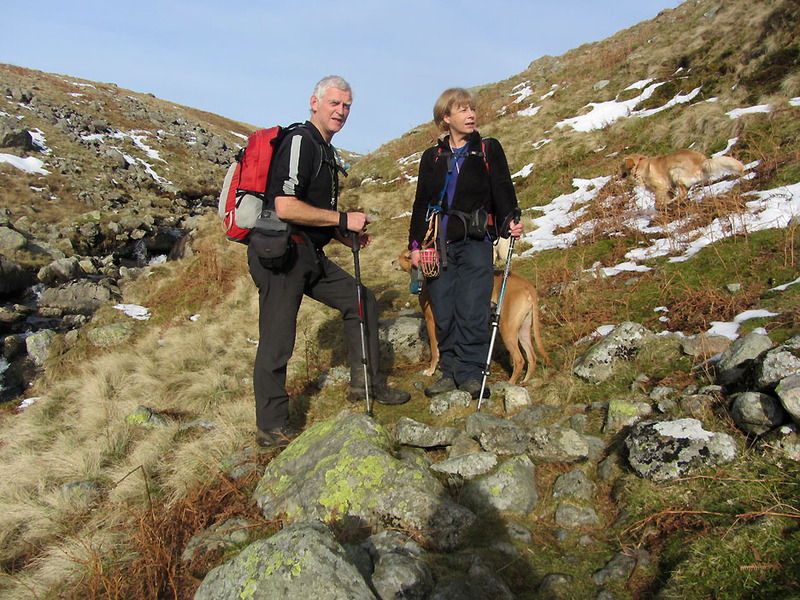 Jo and I stop for a look back at the view but Ann is looking forward to catch us in her camera viewfinder. 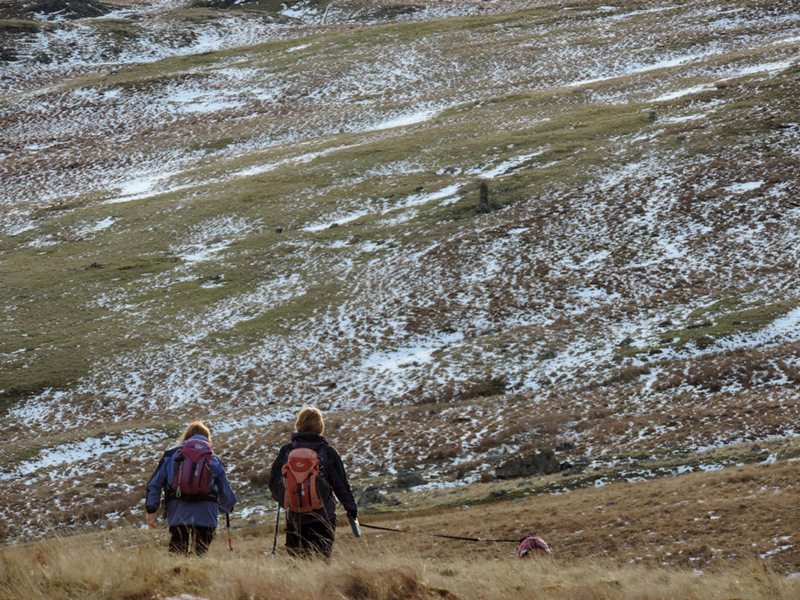 We've reached the snow line and close to the tarn. but a lot of the snow has probably gone in the last week. The water temperature hasn't changed much though as there's a covering of ice on the lake. Dylan and Amber chase each other around, they are still bounding with energy. and ended up breaking through the ice into six inches of freezing cold water ! 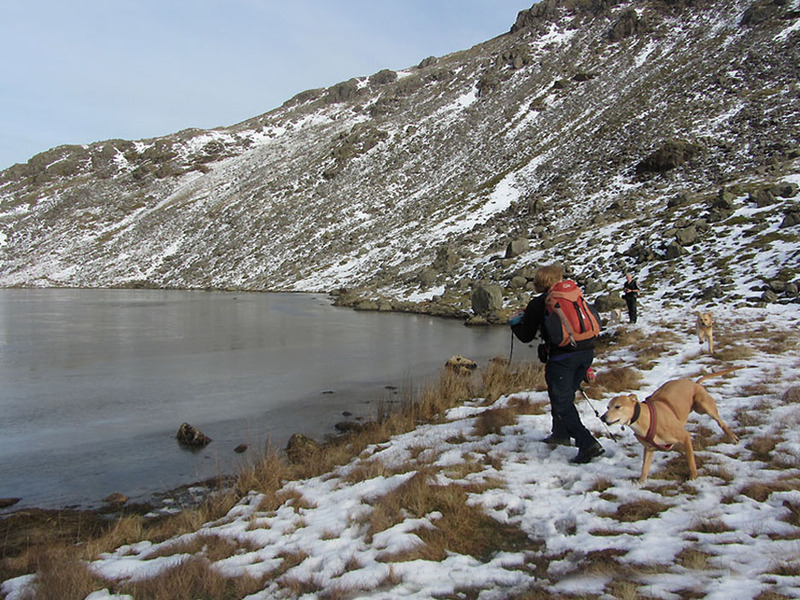 Time for our summit bid and we take a gentle, diagonal line from the lake up towards the ridge. 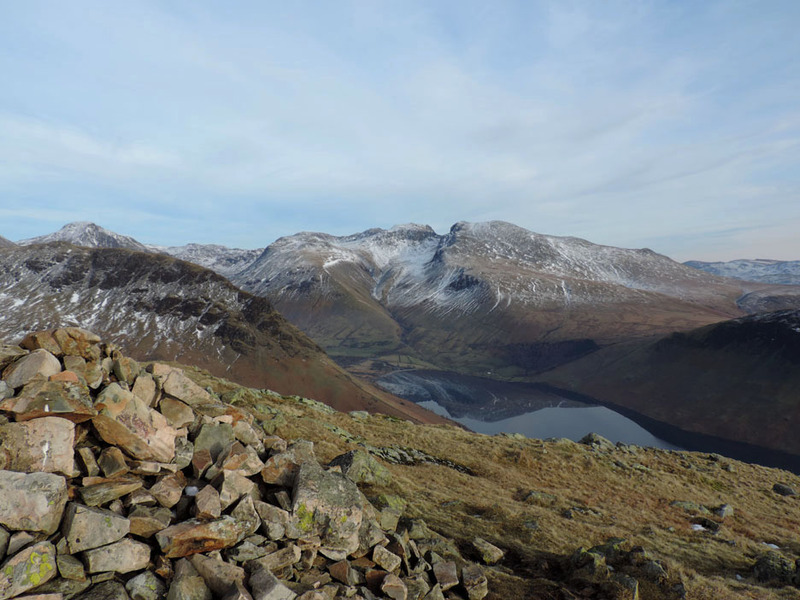 There's no path but just use the larger rocks and crags as waymarks. 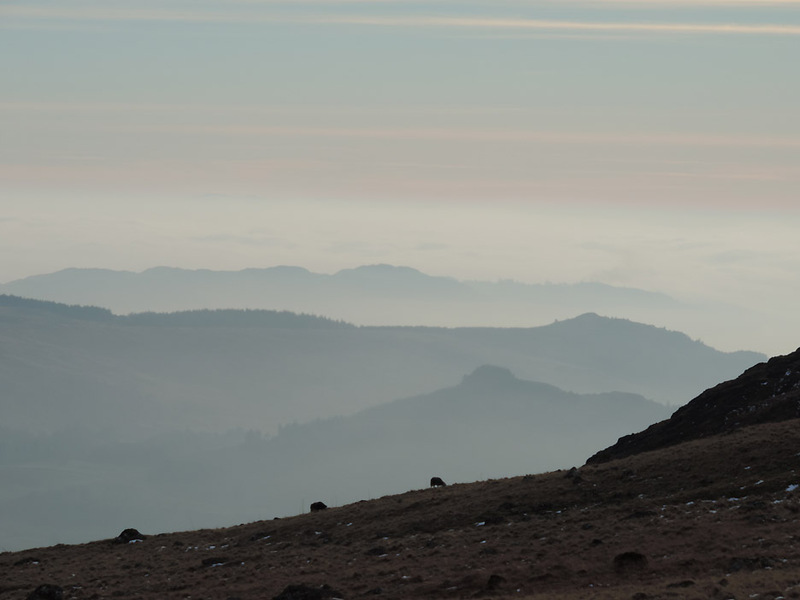 As we climb to the ridge the mists, fog and cloud mix to produce a surreal effect . 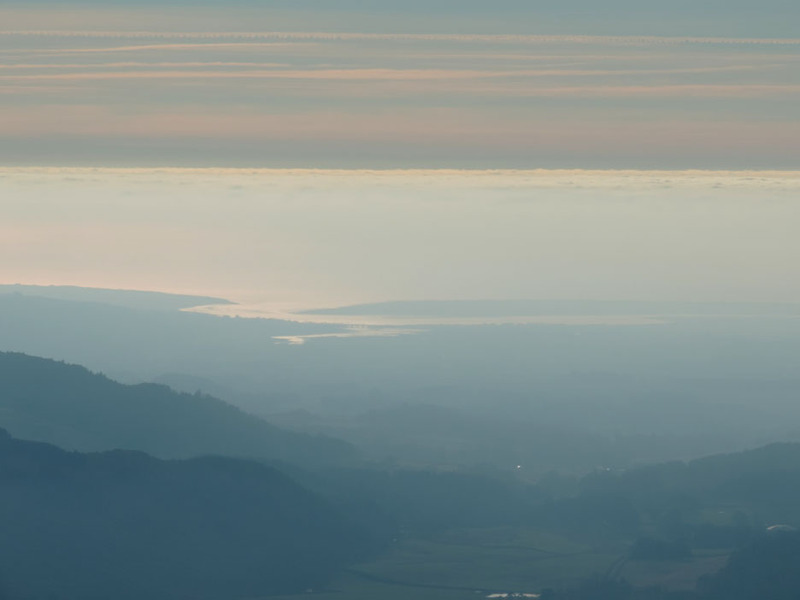 . .
with foreground haze, sun on the water, cloud inversion above, then darker (blue) sky topped by high cirrus cloud. Zooming in on Ravenglass Estuary in the strange visibility. 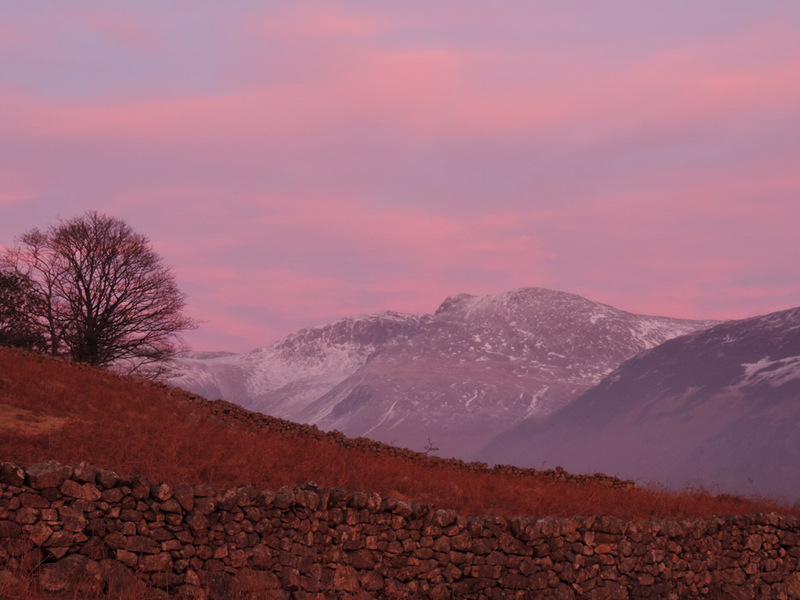 and our expected view across to the Scafells was as spectacular as ever. We had a bonus summit or two today . 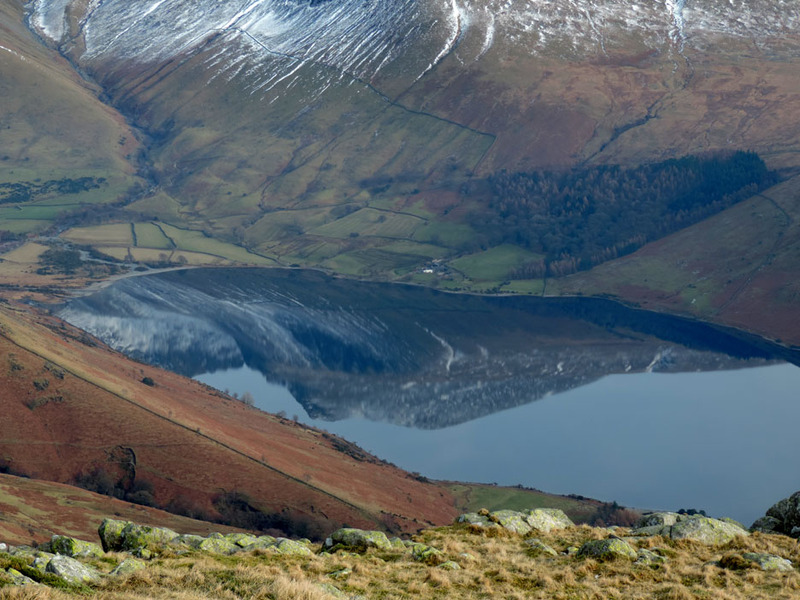 . . reflections on the calm head of Wast Water. Time for lunch and enjoy the view as a few other fellow walkers came and went. 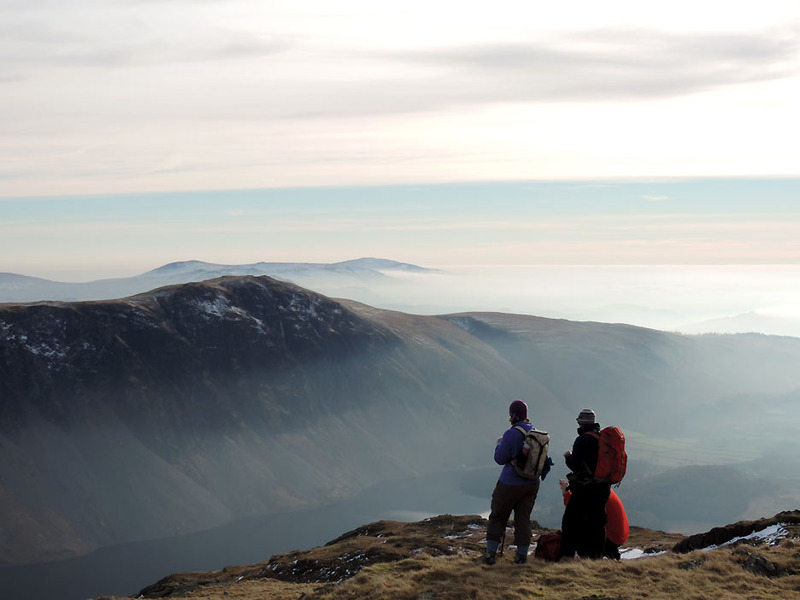 This is the view down the coast to Black Combe to the far south western edge of the Lakes. Round to the north west and across to the Mull of Galloway. The lines on the horizon are a mixture of sea, land and cloud . . . your guess as to what is what is as good as ours. 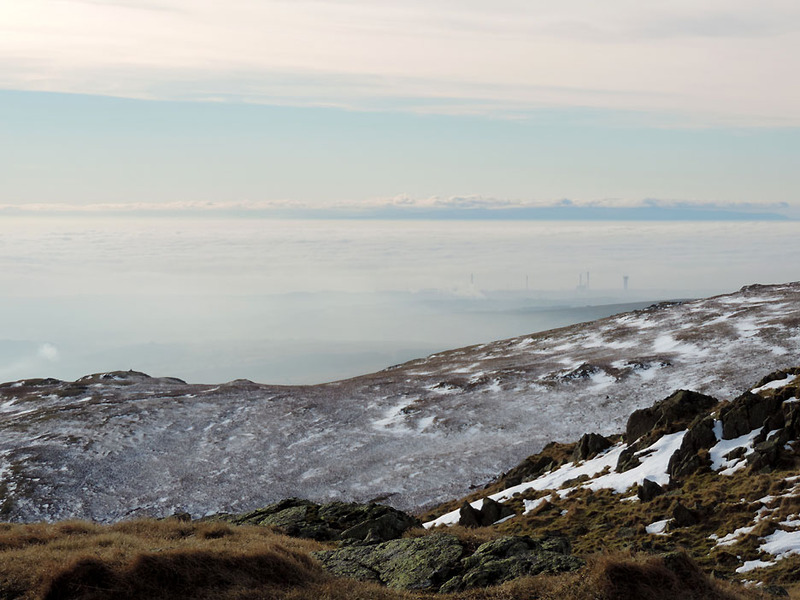 Below us, on the coast, are the towers of Sellafield starting to emerge from the inversion. Lunch over we are on our way again heading across the summit plateau and down the other end. Our route will be on one of the paths on the other side and we will do a full circle of the lake by the end of the walk. 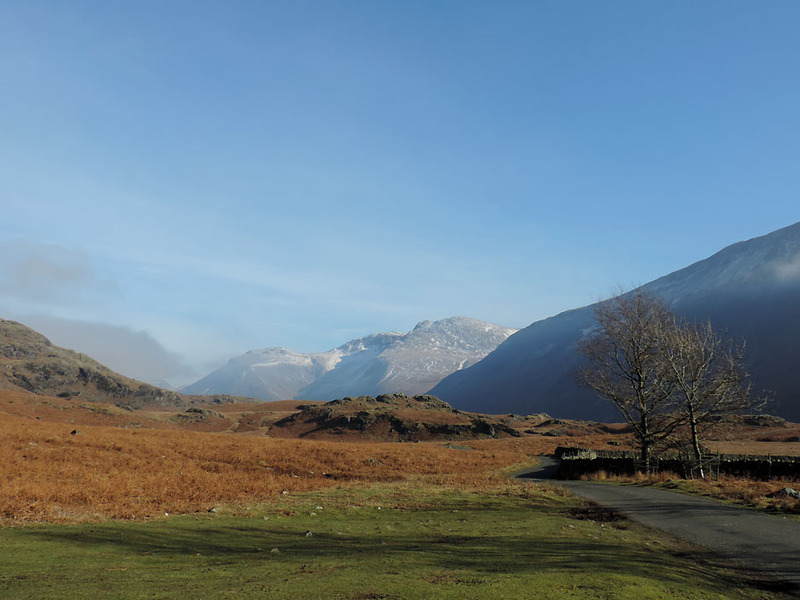 Ahead are some of the western fells . 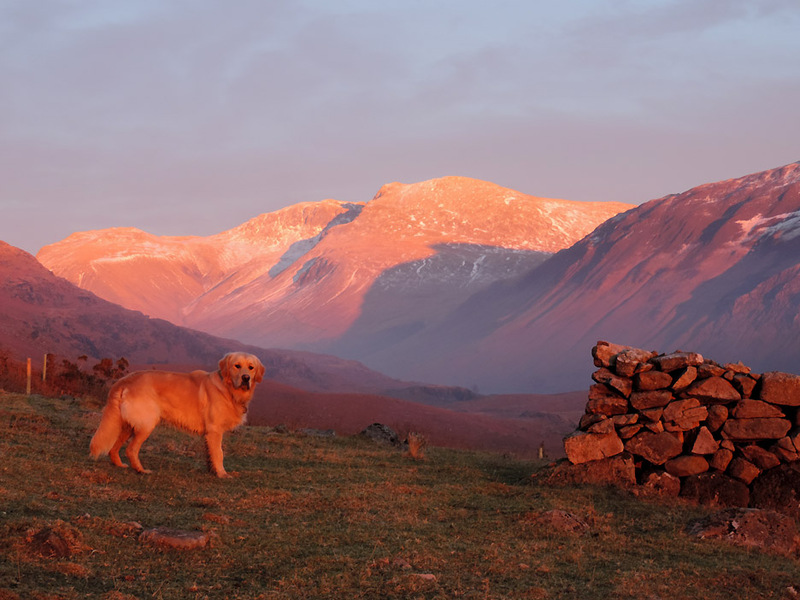 . . notably Red Pike, Kirk Fell and Great Gable. 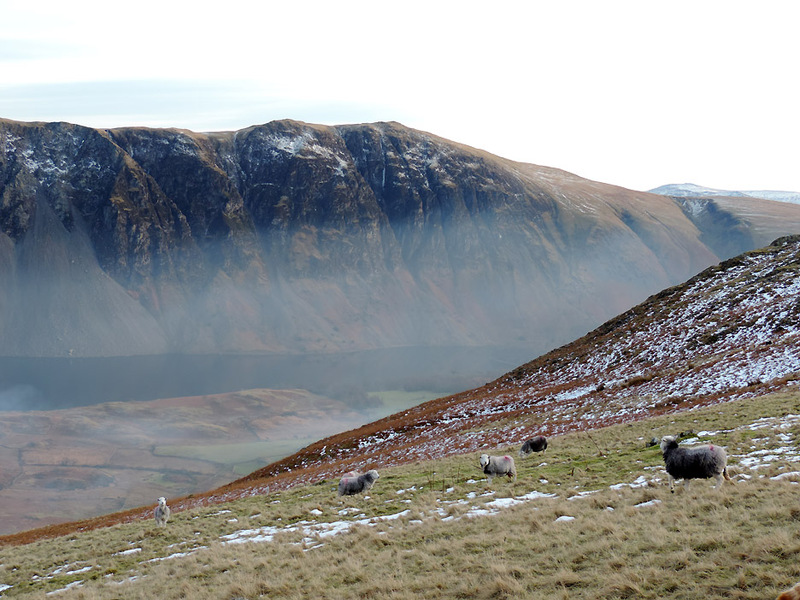 and before Kirk Fell as the hidden Mosedale Valley cuts through the mountains. 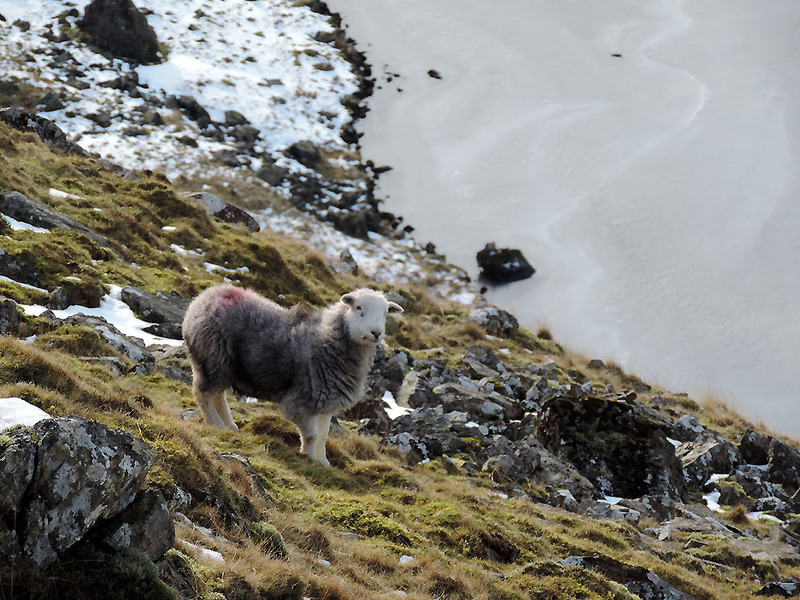 Several hardy Herdwicks are still out on the high fells, taking advantage of the snow melt to find fresh sustenance below. 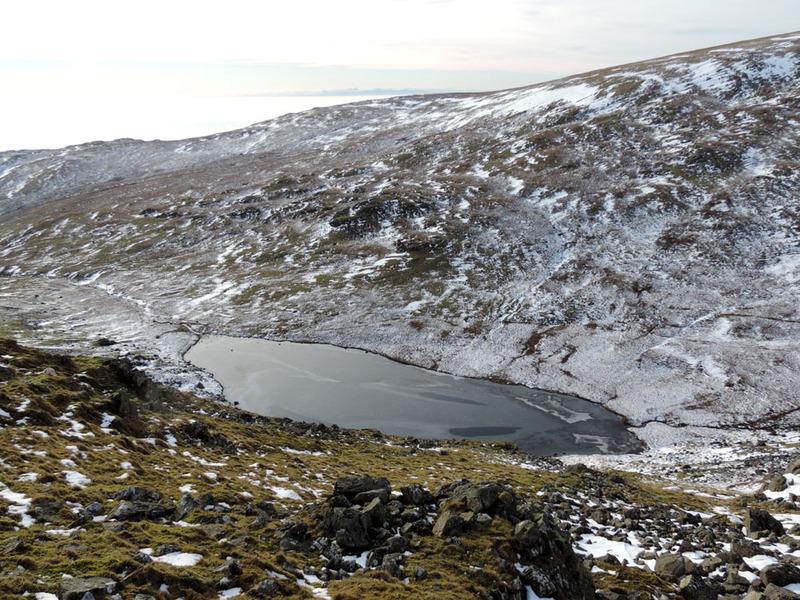 Here we're looking down on the corner of the lake that we were alongside earlier in the walk. Amber leads the way . 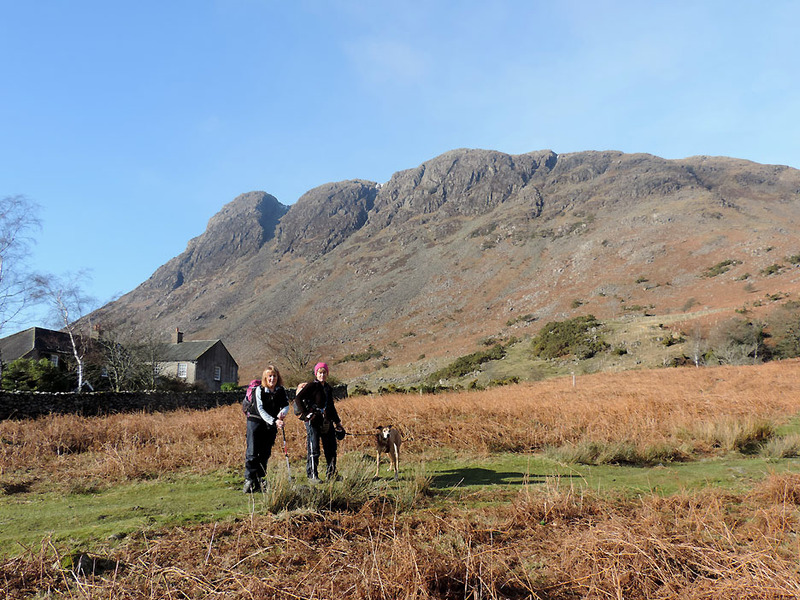 . . ahead is Haycock and Little Gowder Crag . . . but not for us today. We'll be heading left shortly, once we've lost a little more height. as it slowly disappears behind the ridge. The sea inversion is still catching the eye as we round the head of the lake. An island . . . a shark with it's jaw open . . . a filleted mackerel with no head . . . no . . . it's Superman ! No . 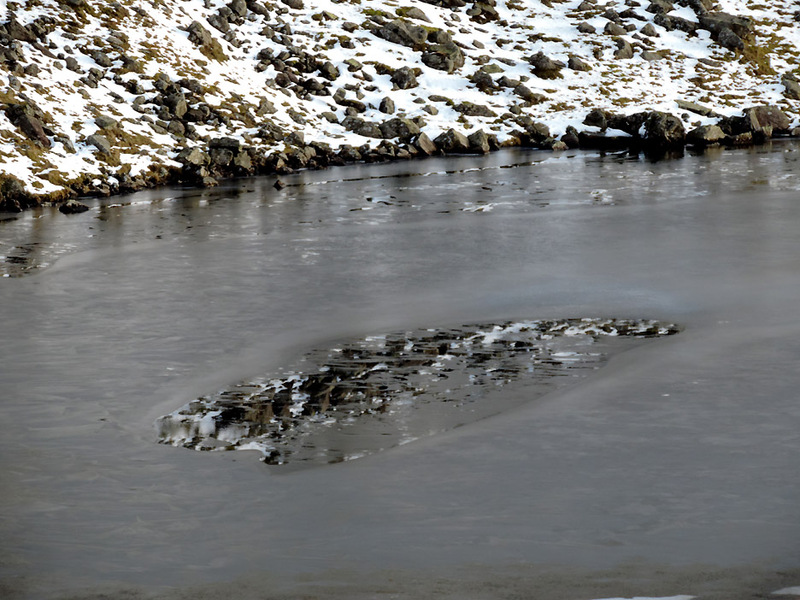 . . it's the reflection of the far shoreline through a hole in the ice ! 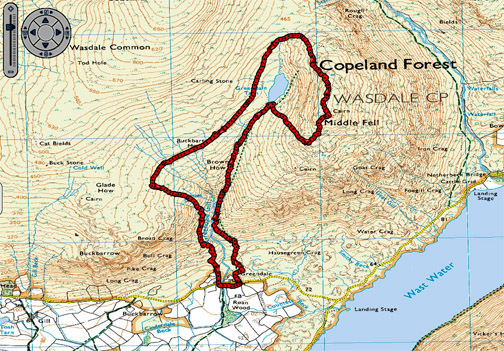 We're starting across the area shown on the map as Buckbarrow Moss. This would imply damp ground, the cold conditions help in keeping it solid but there's still soft patches to catch you out. Zooming in on . . . a study in fifty shades of grey. 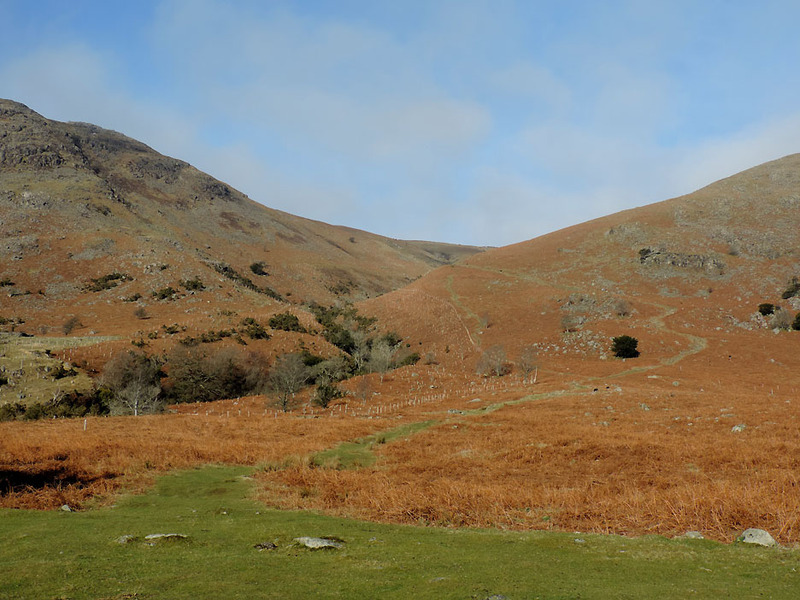 Three of them here are Latterbarrow Crag, Irton Pike and Muncaster Fell. 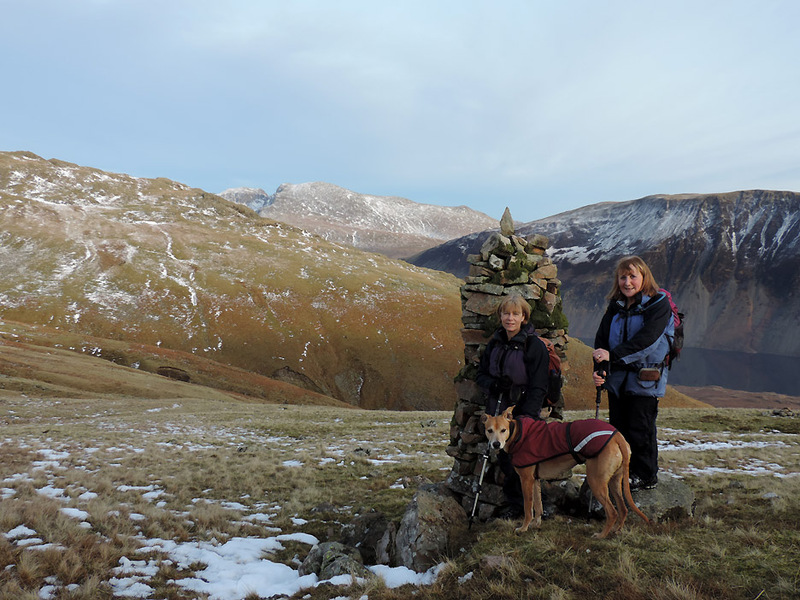 We're heading across country to find Joss Naylor's cairn which Jo has not visited before. 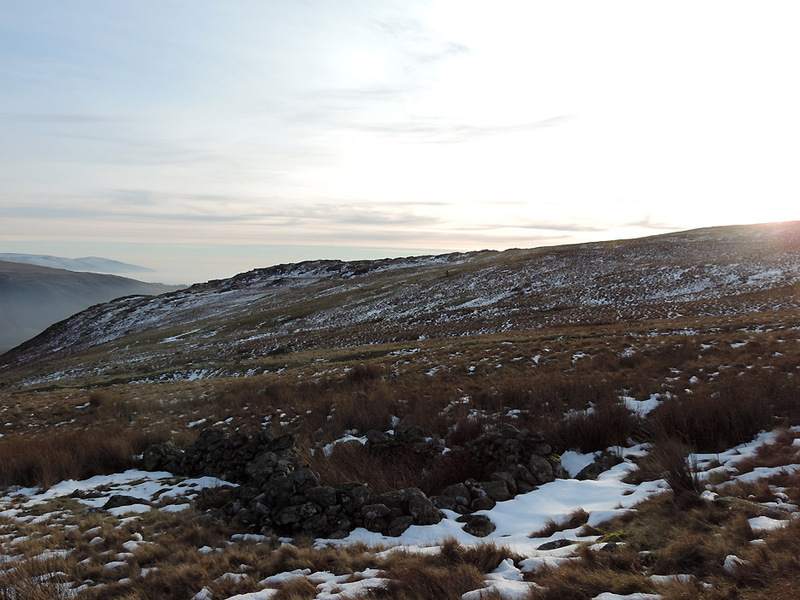 A local sheep fold distracts me as I search the far slope for the large cairn. That looks like it . . . and we contour around the slope to reach it. and was completed on the day that the late Queen Mother was interred. It replaced an earlier cairn shown on the old maps. The strange thing was that it doesn't appear to mark any route or particular viewpoint. Does anyone know more of its history ? 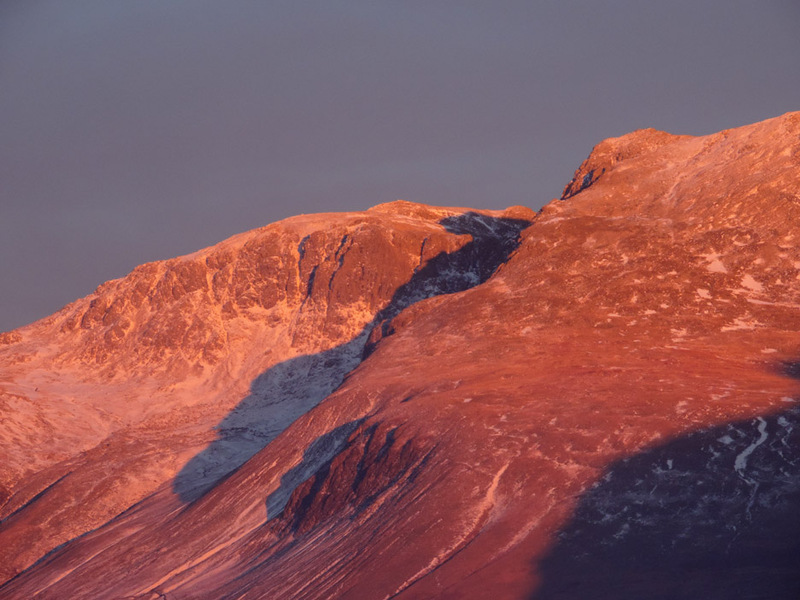 I met Jos Naylor a few years ago and asked him about the cairn, he told me he built it on the site of an ancient burial so presumably he rebuilt the original cairn to his own design. Now to find the start of the steep path down to Greendale below . . . we aim for the small pile of stones a short distance away. 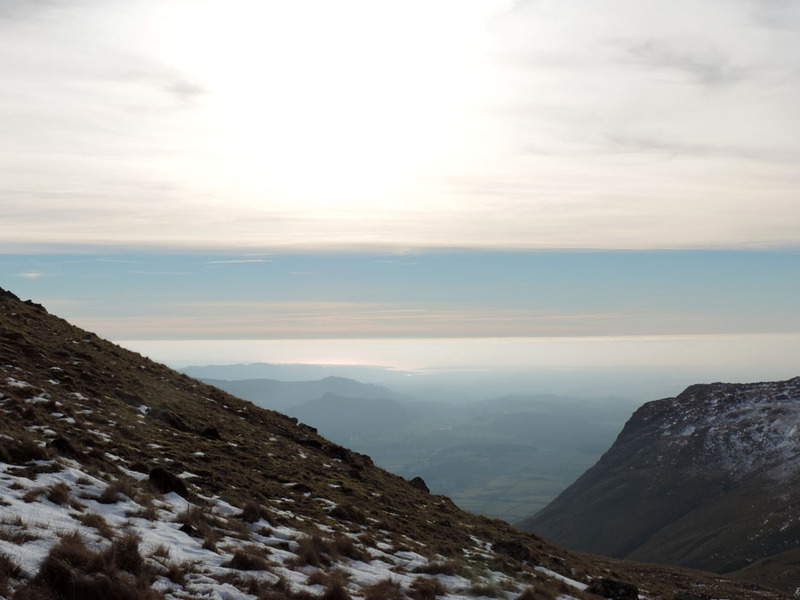 The view down now includes the lake but the inversion has trapped a blue haze in the valley. It is mainly cloud . 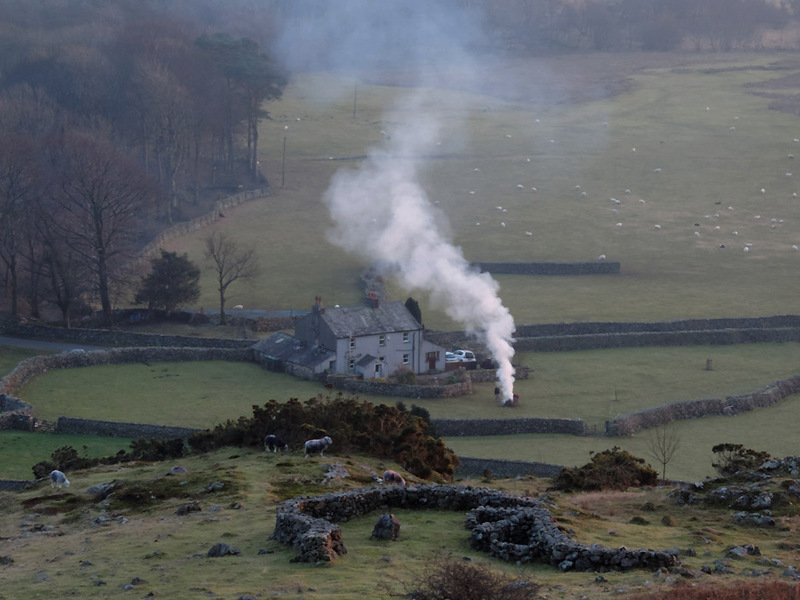 . . but someone has just started a late afternoon fire which further detracts from the clarity. Looking down on a re-built, ancient stone enclosure . . . and that bonfire below. 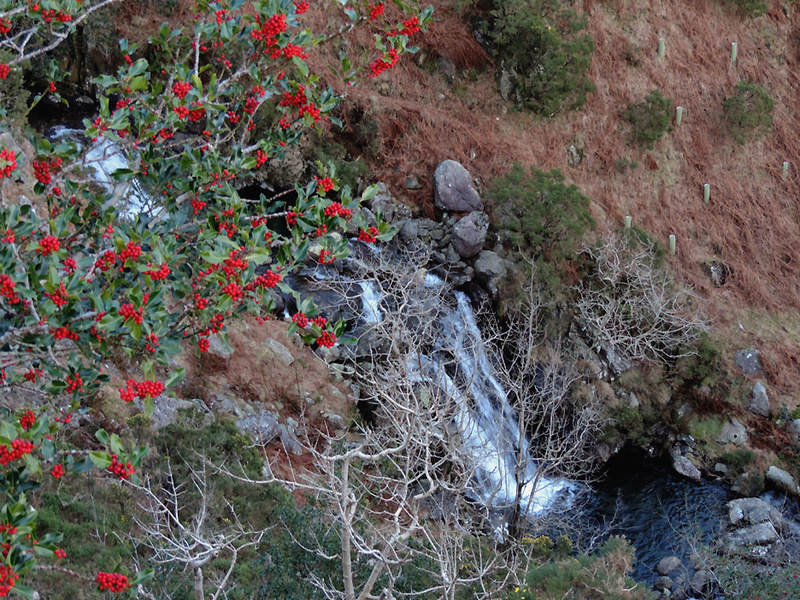 overseen by a holly tree with vibrant red berries still in place. 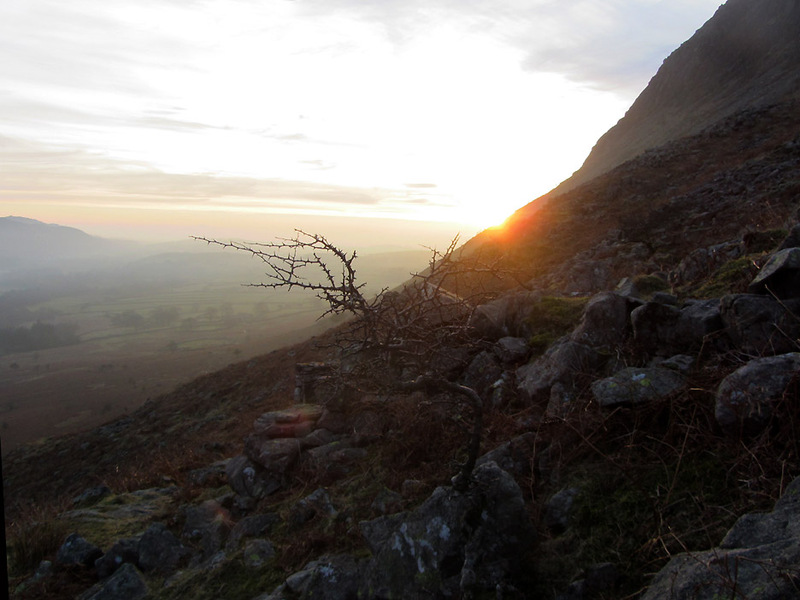 As we emerge from the narrow side valley the sun makes its appearance again. 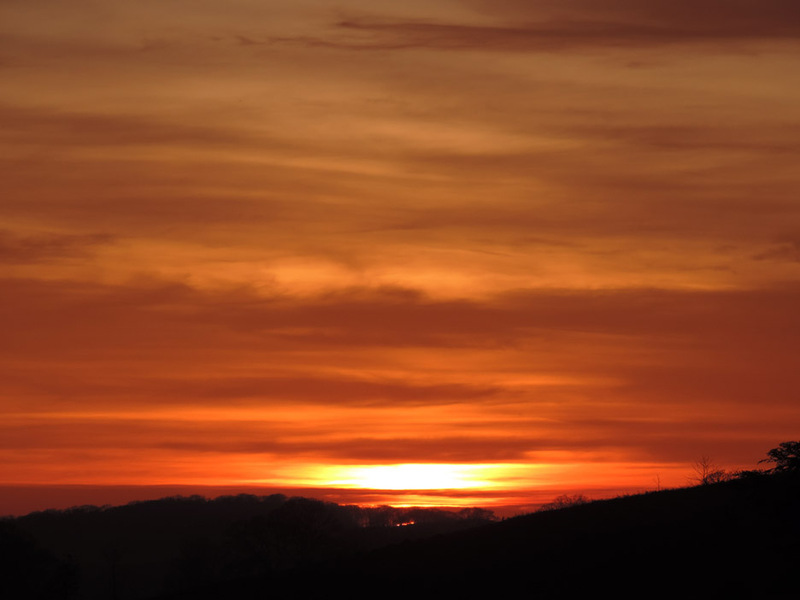 Gradually the light changes as the sun slowly sets behind the clouds out to the west. 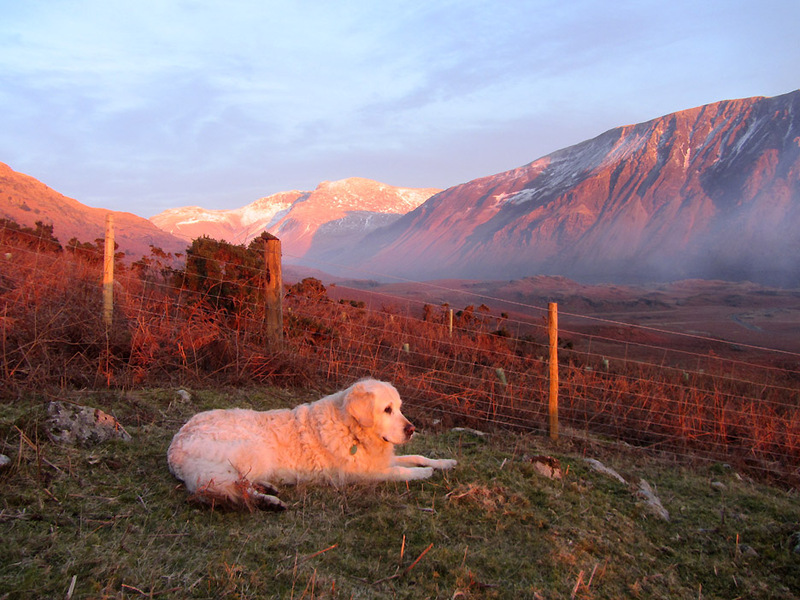 The whites take on a pink hue and the bracken radiates a brighter than normal glow. 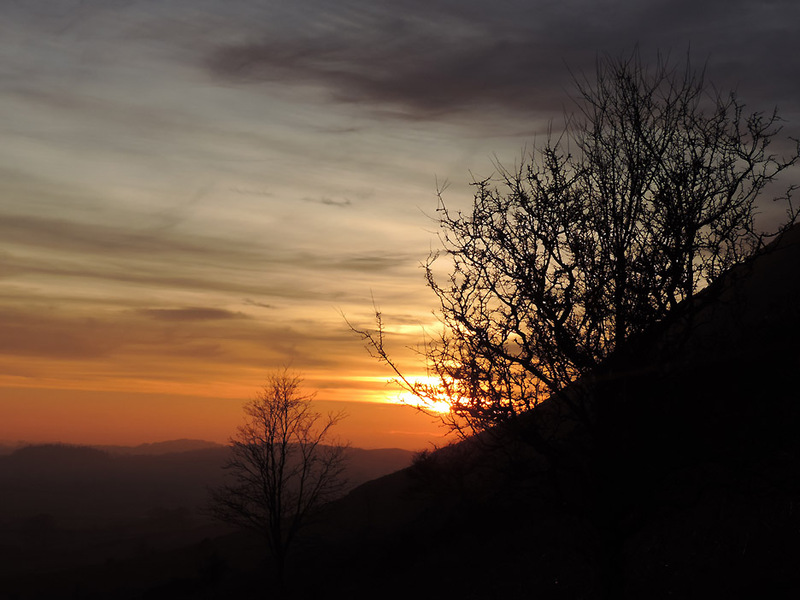 As the sun sets the colours become more intense.
. . . and with it the bracken seems almost on fire ! Down now at the enclosure . . .
Harry takes time out as we stop and enjoy the spectacle. Dylan the "golden retriever ". 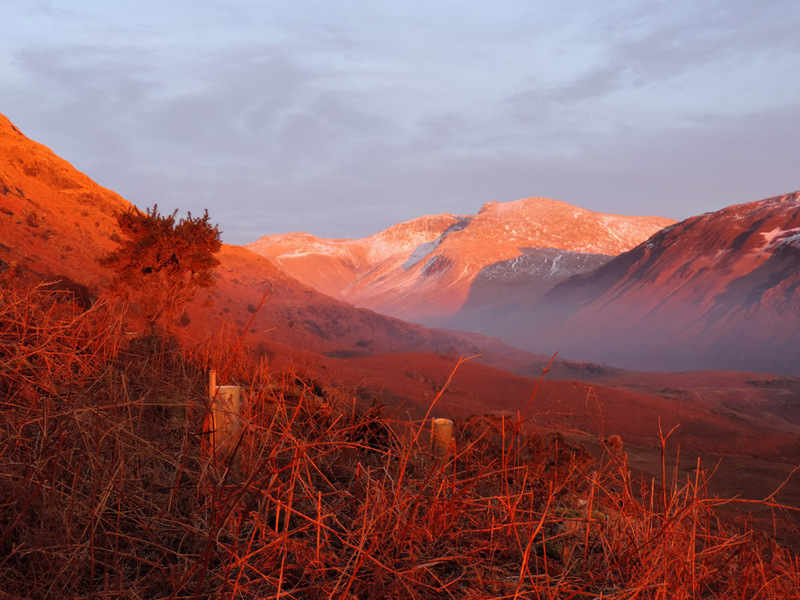 The light has a dramatic effect on the Wasdale Screes too . . . much different from our earlier picture at the start of the walk. 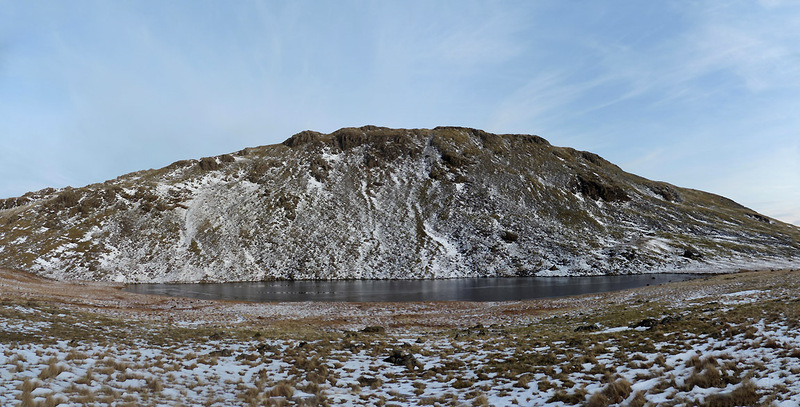 Click here or on the photo above for a wide Loweswatercam annotated panorama. Just as you think it is fading it reaches a new intensity . 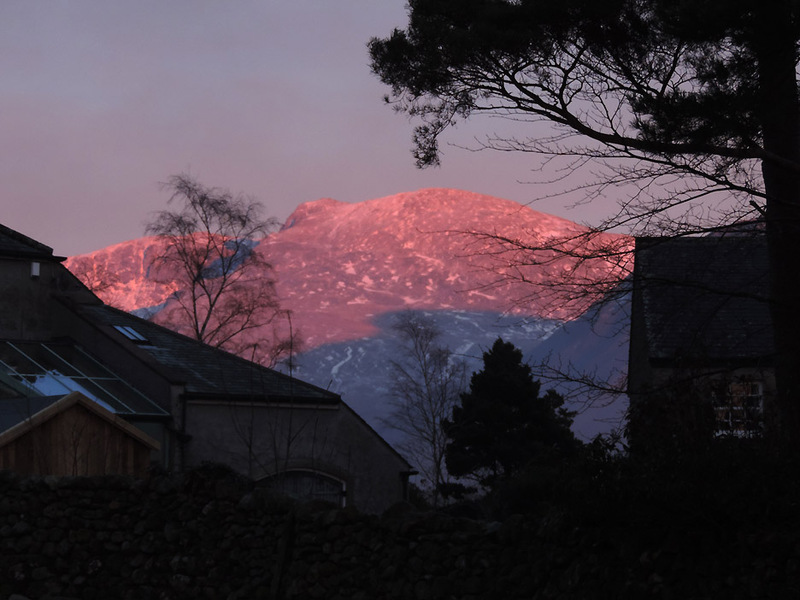 . .
Scafell Pike shines like a real "pink mountain ". 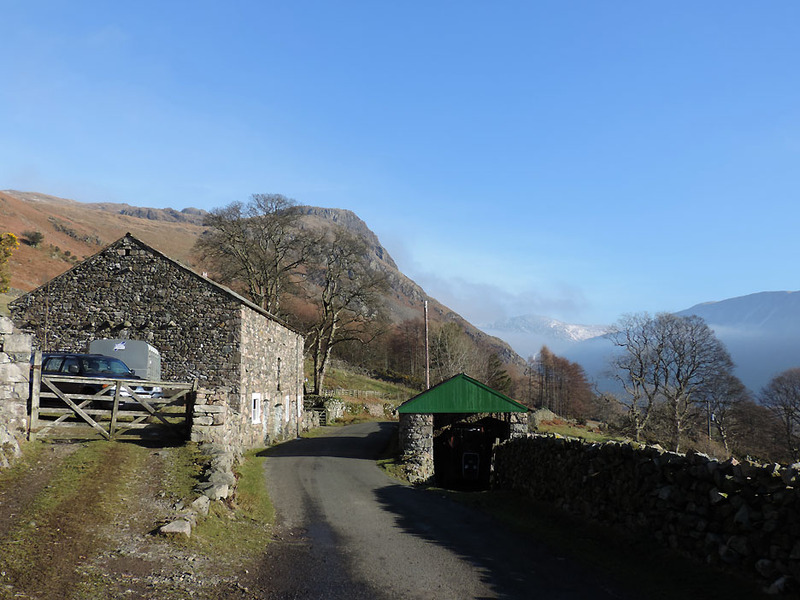 'Tis fading now as we reach the road and the houses of Greendale hamlet.
. . . but the scenes are still dramatic. but the view in the rear view mirror encourages us to stop and get the camera out once more. 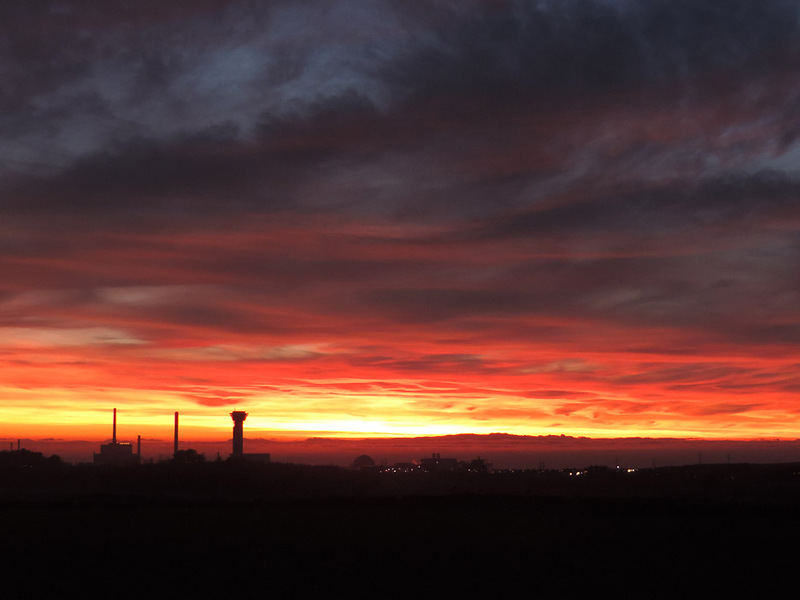 The sun has set but it continues to light up the sky . 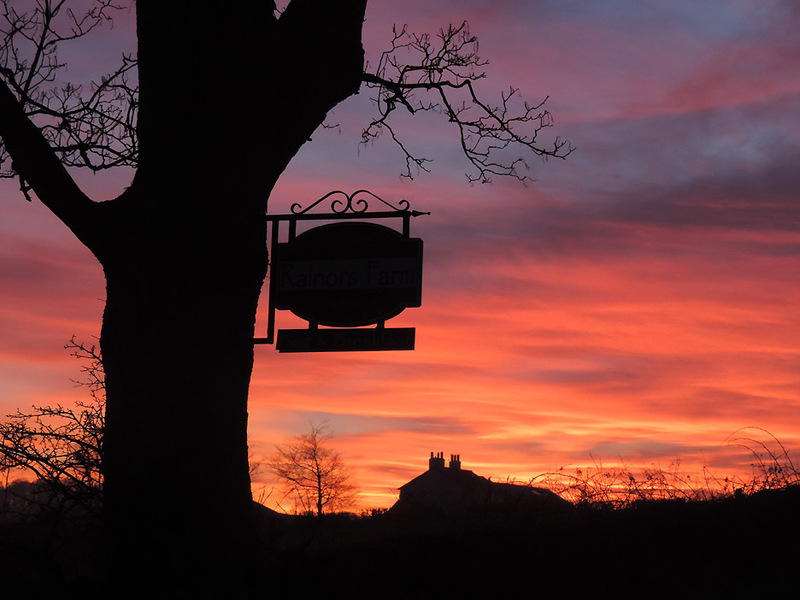 . . as we pass the signboard for Rainers Farm. 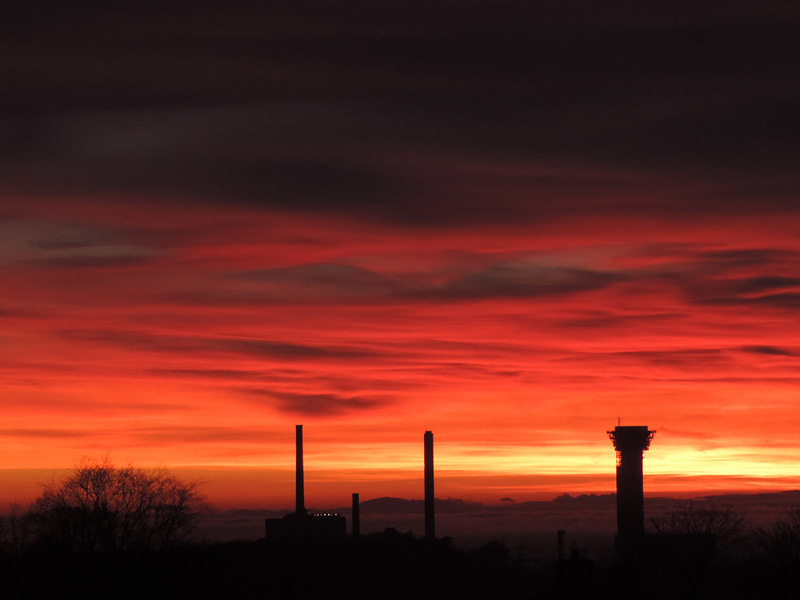 No-one can blame this colour on the nuclear industry . . . but the towers do add scale to the photo. 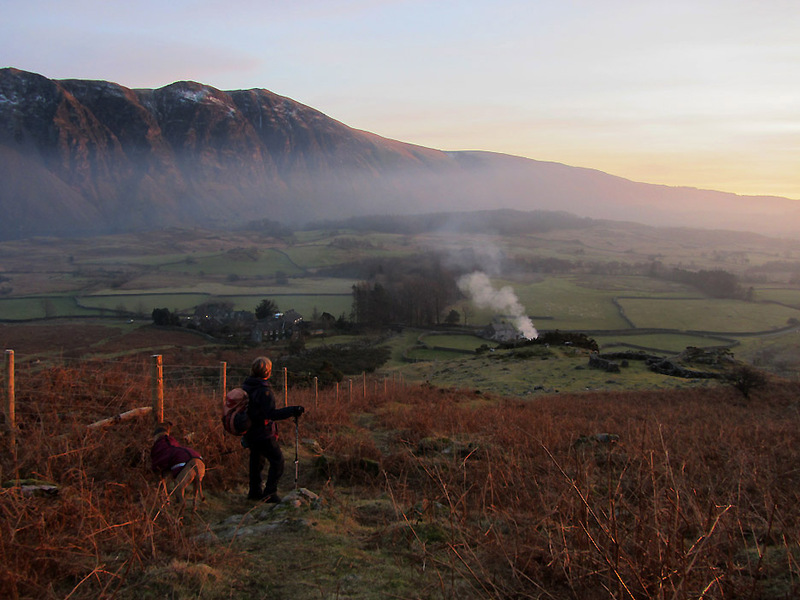 and back to Loweswater at the end of the day. This site best viewed with . . . a climate that surprises at every turn. 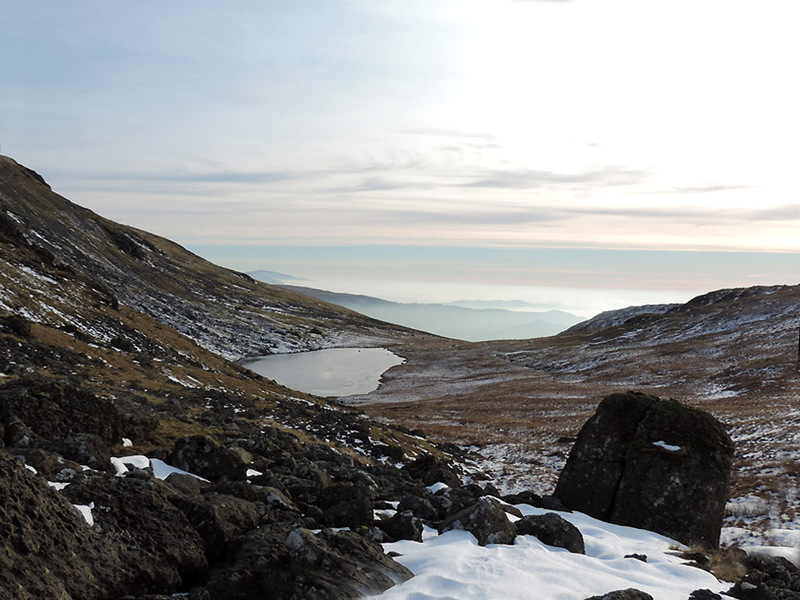 Next walk - 8-11th February 2015 - Inversion or no Inversion ?